Many TV viewers are ready to "cut the cord" on expensive cable and satellite TV services and wish to receive free local TV channels over the air. This requires the one-time purchase of a television antenna. 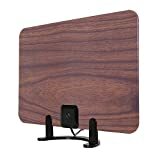 The best indoor TV antenna is affordable, easy to set up, and strong enough to receive local signals. If you're paying a cable or satellite TV company to receive local channels, you're paying for something you can get for free. Your local channels are available over the air if you have an antenna to receive them. Lately there's been a movement of "cord-cutters" who no longer subscribe to expensive cable or satellite TV services. Instead, they rely on streaming services like Netflix or Hulu. 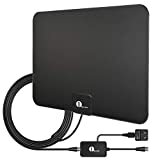 Unfortunately, these services do not carry local programming, but you can access your local channels with the one-time purchase of an indoor TV antenna. 1. Why purchase a TV antenna? If you intend to cut the cord but still want to get local programming, a TV antenna is essential. Even if you're not yet ready to cut the cord, you may want an antenna as an emergency backup. 2. Is an indoor antenna better than an outdoor antenna? An outdoor antenna may get better reception than an indoor antenna, but they are more expensive, more difficult to set up, and not feasible for people who rent rather than own their home. 3. What Is Antenna Amplification? Amplification is a way to boost the antenna's signal strength so that it can pick up channels from far away. Amplified antennas are more expensive and require a separate power source; they either plug into a wall outlet or a USB port on your television. People who live in rural or suburban areas, far away from the broadcast tower, are likely to need amplification for their antenna. However, amplification can actually interfere with picking up nearby signals and result in fewer channels. If you aren't sure whether you need an amplified antenna, we recommend buying a non-amplified antenna first as amplifiers are also sold separately. Directional antennas need to be pointed toward the broadcast tower in order to receive signals. Multidirectional (or omnidirectional) antennas do not. 5. Will the antenna match my decor? Most contemporary antennas look quite different from the rabbit ears of yore. They are often a flat, paper-thin panel that either sits next to the TV or mounts near it on the wall or in a window. Most come with a different color on either side (typically black and white) to better blend in with wall color and some are paintable. 6. What else should I know before buying? Finding the right antenna can be hit and miss, so before you purchase, check the seller's return policy in case you need to take it back. 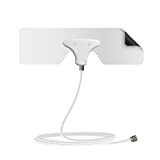 The indoor TV antennas on our list range in price from $10 to $80. The wider the range of the antenna, the more expensive it is likely to be. Therefore, amplified antennas that boost the range of the antenna up to 60 or 65 miles away are likely to be more expensive. 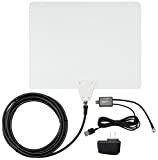 When you're buying an indoor TV antenna, keep in mind that the directionality of the antenna is also likely to be a factor in pricing; a multidirectional antenna that does not need to be pointed in the direction of the tower is likely to be more expensive than one that does. The antennas on our list are all multidirectional. Before we get to the top ten list, we want to point out that there are dual-purpose TV antennas that can be used either indoors or outdoors. In the interest of keeping our list at a manageable ten, as well as to avoid confusion, we eliminated indoor/outdoor antennas from our list and focused on those that are only to be used indoors. In some cases, there may be a related model of antenna that did not earn a spot on our list, either because it was similar to an​other model that is included on the list or because it didn't meet our indoor-only criterion. These models rated an honorable mention underneath the entry of the related model. If you decide to purchase one of these antennas, most of them are available for purchase direct from the manufacturer's website in addition to the retailers listed below. Key Features: It has a ring-shaped design, with adhesive tabs included, and a detachable 12-foot cord. The unique design becomes a conversation piece, lets in more light when mounted in a window, and doesn't obstruct the view. It has the longest warranty of any antenna we reviewed. However, it's on the pricier side of the cost spectrum for an unamplified antenna. It's on the pricier side of the cost spectrum for an unamplified antenna. 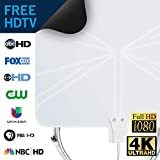 Honorable Mention: The Clearstream 2Max HDTV Antenna is highly rated by reviewers but was disqualified from this list on the basis of being an indoor/outdoor antenna. Key Features: As suggested by the name, the antenna is ultra-thin and reversible, with a black side and a white side to better blend in with home decor. It is amplified, with a range of 50 miles, and comes with Velcro dots and pins for mounting. This is an amplified antenna that is comparable in cost to its unamplified counterparts, offering great value for the money. It is easy to set up and use. But it offers less aesthetic value than the ClearStream Eclipse or the Mohu Curve. It offers less aesthetic value than the ClearStream Eclipse or the Mohu Curve. Amazon; eBay may have it as well, but was sold out at the time of this writing. Honorable Mention: AmazonBasics also offers a 35-mile range model that does not include an amplifier. 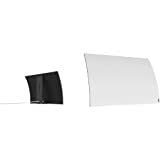 Key Features: The ReLeaf is a flat antenna based off the previous Leaf released by the same company but designed and constructed specifically to be eco-friendly. The ReLeaf is constructed entirely of recycled materials. The plastic components (including cables) are made from recycled cable boxes and the antenna portion is made from recycled post-consumer cardboard. Instructions are printed on the inside of the box to save paper. It doesn't come with any adhesive; instead, it has pin holes to allow it to be pinned to a wall. Constructed entirely of recycled materials. Instructions are printed on the inside of the box to save paper. Honorable Mention: The Mohu Leaf was the inspiration for the ReLeaf but is too similar to warrant a separate entry. Key Features: It has a distinctive style with wood-grain pattern on either side for those who like a retro feel. The plastic components (including cables) are made from recycled cable boxes and the antenna portion is made from recycled post-consumer cardboard. Instructions are printed on the inside of the box to save paper. Some may find the wood-grain design too old-fashioned, ostentatious, or kitschy. Some may find the design too old-fashioned, ostentatious, or kitschy. Key Features: This is a free-standing amplified antenna with a range of 50 miles. Its unique curved design blends in with decor and adds an artistic touch. It cannot be mounted to a wall and is relatively expensive. Key Features: It has a range of 50 miles, and the amplifier toggles on and off with a switch. It is easy to place with a thin and lightweight design. Setup is plug and play. The cord is not detachable, meaning it cannot be swapped out if it isn't long enough. However, at 20 feet, it is one of the longest cords on this list and this shouldn't be an issue. Cord is not detachable, meaning it cannot be swapped out if it isn't long enough. Key Features: Designed for small, urban apartments, the Leaf Metro has a shorter range but also takes up less room in a compact living space. It boasts approximately half the surface area of most antennas, meaning it won't block the light or obscure the view from a small window. It has a narrow range of 25 miles and is not intended for rural or suburban dwellers. Its amplification makes it one of the most powerful antennas on this list, with a range of 65 miles. It can lay flat or stand up with the aid of the included stand, or it can be mounted on a wall. 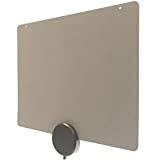 While flat like most of the other antennas on this list, it is considerably thicker at 1.2 inches and is therefore likely to be more conspicuous when mounted to the wall. It's also the most expensive antenna on this list. It's also the most expensive antenna on this list. Key Features: Like the Mohu Leaf Metro, this antenna is geared toward city dwellers but presents a less discreet profile. Price is very reasonable at $10 to $20 dollars. At least one reviewer found it to pull in more channels than more expensive competitors. Cord is non-detachable and rather short at only 6 feet. Pull in more channels than more expensive competitors. Amazon. Check eBay, Wal-Mart, and Home Depot. 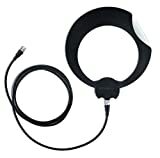 Key Features: This antenna comes with two 3M adhesive strips for mounting purposes, a 15-foot cord, a 30-mile range, and is reversible with white and black sides. The design is thin, and the different-colored sides are intended to blend in with your decor regardless of your wall color. It does not come with an amplifier. It does not come with an amplifier. Can mount to wall or stand on table, sleek design. If you need an amplified antenna, we feel that the AmazonBasics UltraThin offers everything you need at an unbeatable price, unless you need a longer range than 50 miles, in which case the TERK MTVGLS is probably your best bet. For unamplified antennas, it is hard to choose between the ClearStream Eclipse and the Mohu ReLeaf. We are impressed by the lengths that Mohu went to in order to create an environmentally friendly product made from post-consumer waste; therefore, ultimately we would give the edge to the ReLeaf. This website may receive financial compensations from some of the links to products or services on this website.